How to "tune" it to suit special needs! It was never my intention to make the "worlds best stepper driver"... The linistepper was designed for my own use, and where it lacks some precision and energy efficiency it IS well suited for many hobby and low power industrial tasks. The main aim in the design was to provide a cheap platform that can accept common and cheap power transistors and use a PIC to do the "hard work" of current control and microstepping. It is very versatile and can be "tuned" for many different applications. When properly tuned it will out-perform any microstep driver in a similar price range, and even outperform many expensive high-end drivers in specific applications. The linistepper is a constant current driver, ie it CONTROLS the amount of current through each motor coil. Microstepping requires that TWO separate current levels are controlled, one for each motor phase. I used simple current control, based on the voltage Vbe of the power transistors, as this system has worked well for me in the past and is simpler than a closed loop system typically using op amps etc. The transistor characteristics change with junction temperature, so the transistors perform differently when hot. When the transistors are cold the current will be 5% to 10% less than the "tuned" current at the typical operating temperature of 45 degrees celcius. Normally this is not a problem, as the microstepping angular accuracy of the motor itself is rarely within 5%. 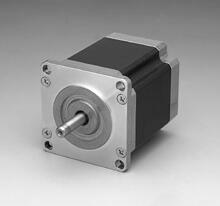 If you have specific needs for high accuracy, and you have special- purpose high angular accuracy motors, you can adjust the resistors for a specific temperature range and then keep the driver in that temp range to suit. For most apps this is really not necessary, the linistepper will be a few percent low in current when cold and soon drift to a close- enough current when at operating temperature. This is a very small problem. If you vary the psu voltage by a large amount the current will drift a small percentage. The typical 10% or so that a psu droops voltage under load will generally cause less than 1% change in current. In most cases this can be totally ignored. Again this is a very small problem. My design calls for 1v across the sense resistors when the phase is at 100% current. It is easy to see and tune phase "current" on the CRO. At phase currents of 1A, and using resistors of 1 ohm, each resistor will dissipate a maximum of 1W. Average dissipation (ie a running motor) will be about 0.7 volts per resistor, (ie 0.7W) and the kit contains 3W resistors which will run at a reliable temperature. This may become an issue when tuning the linistepper for higher-current motors, more about that later. As the transistors heat up to their normal operating temperature the current will increase a few percent. If you don't have enough heatsinking and the transistors get TOO HOT it is possible for the driver to go into thermal runanway where the transistors are destroyed and possibly your motor too. It is IMPORTANT to run the motor at a standstill for one hour at FULL CURRENT and measure the temperature of the transistors. As the system will draw from 50% current to 100% current depending on what microstep it is on, the only way to do this is set the driver to 200 step mode (full step mode) where it always draws 100% current through BOTH COILS. This is your worst case current load. As the motor properties are known, if it is heatsunk adequately for this one hour test it will be reliable long term and you won't have to worry about this again. If the transistors fail, they will fail short circuit and expose your motor to excessive current, which depends on your psu voltage and may be a few times the normal phase current. This is enough to cook the motor if left unattended. A slow-blow fuse rated about 2.5x the max normal phase current (if motor is 1 amp/phase use a 2.5 amp slow blow fuse placed before the linistepper) Fuses are always a good idea! Thermal switch (goes open circuit at rated temperature) are available in a few packages. Attach a 80 degree celcius or thereabouts thermal switch close to the transistors. This is worthwhile if your motors are expensive, even though the switch will only ever activate in a severe fault situation. In most cases a simple fuse and a TESTED HEATSINK will give all the reliability you require. Remember the number one rule: Keep the transistors under 50 degrees celcius! The linistepper kit is supplied with 1 ohm sense resistors. These will give 1 amp per motor phase (2 amps max). Remember to tune current with the driver transistors at the expected operating temperature, normally about 45 degrees celcius or 113 F.
The reciprocal nature of the sense resistors means that it is easy to add resistors in parallel to give the required current. The circuit board has provision to add up to 3 resistors in parallel, to allow fine tuning of motor current. This calculator can help you find the resistors to combine for any desired current. This Electronics design utility finds sets of resistor, using standard values which, when paralleled together, give your target current value. amps/phase maximum. That is a total motor current of 3 amps. between rated coil volts and amps (written on motor). huge motor size they simply require larger currents. change some parts values in the linistepper. * you will need electronics skills and test equipment! from the linistepper but currents of 5A/phase etc are not very sensible. transistor Vbe junction, and base drive current (darlington beta). and changes in microstep currents from cold to hot become much greater. that mode with acceptable heat range accuracy. and change the values of R18-R29 to give the correct phase currents. the linear current ramping of the linistepper, it can be worth the effort. I have seen 3A/phase microstepping ramped drivers costing $500 USD. software PWM and can move the camera to ANY possible angle. to give other microstepping modes. 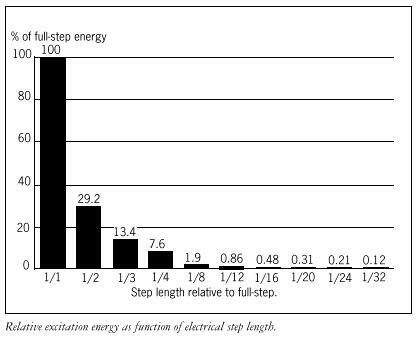 Popular microstepping modes are 800 steps (quarter) and 1600 steps. drive to super-smooth motion control. I have been running the linisteppers for a while, but im having problems with the heat dissipation, the linisteppers are modified for a "Vexta PK266-02A" motor (i have paralleled the 1ohm sense resistors R1 and R2 with two identical resistors making R1 0,5 ohm and R2 0,5 ohm. the stepping mode is half step. I'm only having overheating problems with my Y-axis. The psu is 12V 10A. Im using the CPU-heatsinks that i ordered from you along with the linisteppers. I have ordered a larger heat sink, that i will mount before running the machine again. Is there any more tips you could give me? would a difference in speed generate more heat? i adjusted my software to get more mm/min. the motors are quite warm 50-80 degrees celsius. I'm looking at possibly getting a LiniStepper (or three) to drive Vexta PK266-02A motors (3.6V @ 2A per phase, unipolar), an dI'm trying to figure out the modifications I would need to make to the resistor values. I know I'll need to add a 1 ohm resistor in parallel with the existing sense resistor, but I can't for the life of me figure out the changes to R14-17 and R18-29 that are implied in this tuning page. Am I still "close enough" to spec to use the components given? If not, how do I calculate what the new values should be? It looks like R18-19 and R24-25 pair with R14-15 and R16-17 as a voltage divider, but I can't, for the life of me, figure out what the remaining resistors do. I assume it's another voltage divider, but the diodes have me stumped... If you could help me understand what they do, and how I would need to modify the values, I'd appreciate it! Does anyone have ideas on how to make a stepper go faster before stalling? At the moment the fastest I can get my stepper to turn is about 2.5rev/sec before it just sits on the bench and hums. I have a stepper motor with part number FL60STH86-2008BF (6V, 2A) and Iâ€™m using the two 1ohm resistors supplied with the LiniStepper. I have tried both 12V and 24V power supplies. It doesnâ€™t seem to matter what step mode Iâ€™m using (3600, 1200, etc) the maximum speed tops out at about 2.5rev/sec. I have a decent fan-cooled heat sink so cooling is not an issue. -Remove-fernandezlspam at ~NOSPAM~gmail.com asks: " Its posible changing the power resistors to make linistepper compatible with motors from old disk? they are rated 150ma. Can you explain me really the difference between bipolar chopper and linear stepper drivers and why linear stepper drivers more significant. How smooth the operation can be. show me how linear operation does work.